This album was originally released as a limited-press CD-R entitled "Sulatronics 2". 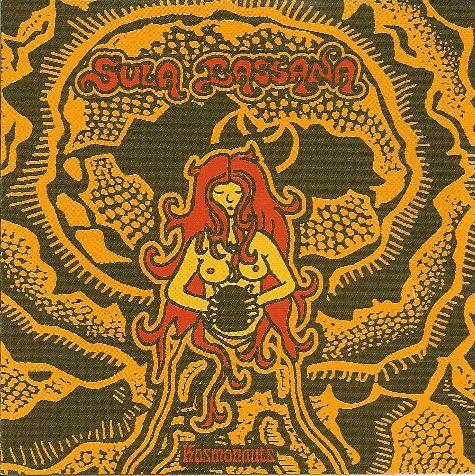 Sula Bassana is Dave Schmidt and this is intended as an electronic side-project to his more rockin' stuff (which I have yet to hear). Five tracks in the 10-14 minute range... hard to call it anything but spacey melodious electronica really, and that's good enough for me. I'm reminded at times of Anubian Lights, which is a good thing, not to mention Kraftwerk... can't say Schmidt has his own sound here, but on a couple of these tracks he certainly has his own music. Barbarella: Not the best piece here, but the synth-work is full, luscious and candy to the ears. Thora is my favorite: the beat, keyboard sequences and a pretty underlying melody are built upon by constantly shifting waves of space-tronics throughout... the bass adding extra warmth... this gets quite busy and demands focus to remain aware of all the levels... though one can totally trance-out. There are some nice drop-outs later, too, which lend even more potency and a sense of composition to the whole. Next fave: Stella Star - same basic framework, the non-percussive constant being a low almost-grinding effect... and later these well-placed, trippy synth flare/fade-outs... (and so far, there's mouth-harp on all these tracks, too). Schmidt has a good sense of rhythm, which is needed to hold all the sound layers together... mmmm, a nice keyboard line has arisen, reminding perhaps of early '80s Hawkwind. Trillian is less than exciting mainly because I've heard something too similar to this keyboard sequence elsewhere (can't pinpoint it). The closer Pygar is slower, more drifty ambient stuff, but pretty standard... kinda blah. Sure dig Thora and Stella Star, though!